MTS is the extension name for AVCHD (Advanced Video Coding High Definition) video which is known as extremely high quality. Since this type of file features perfect quality, it is widely used in professional HD video recording devices. However, MTS file takes a large storage, the Mac computer and iOS devices may freeze when playing or editing MTS video. It’s very discouraging for Mac users who need to watch and edit MTS video. This setback may be worse for those people whose computer configuration is not high. For this case, one of the best solutions is to convert MTS to MOV file via a video converter. MOV file is the format for QuickTime Player, which was developed by Apple Inc. It has the advantages of less space occupation and better quality. Undoubtedly, this format is the best MTS video alternative for playing and editing on Mac. To know how to do this job exactly, you may check the following parts. Video Grabber is a web-based program that allows users to convert video file to other formats, such as MP4, AVI, WMV, MOV, etc. Also, you can change the video to audio file in the formats of MP3, WAV, AAC and so forth. In addition, you’re allowed to configure output settings based on your preference, like customizing resolution, bitrate and frame rate for video and audio. You will learn how to convert MTS to MOV video from the instructions below. 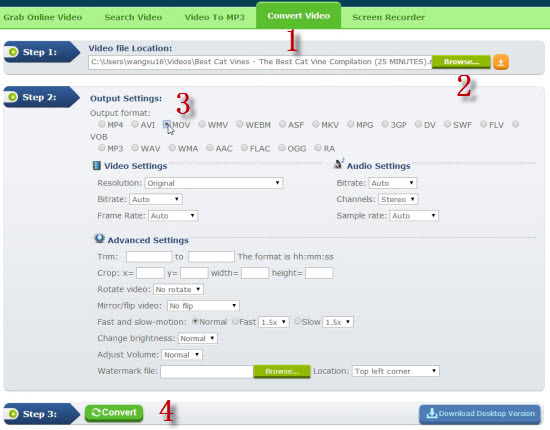 Go to the site of Video Grabber and click the tab of “Convert video”. Click the button of “Browse” to load your MTS file. Choose “MOV” option and customize video settings in “Step 2”. Press “Convert” button to get start and select local saving path for the output video. This online program is 100% free without any restrictions. But this tool may fail to work normally when your network is not so good. Under such circumstance, a desktop version will be a nice alternative. Go ahead with followings to learn more details. 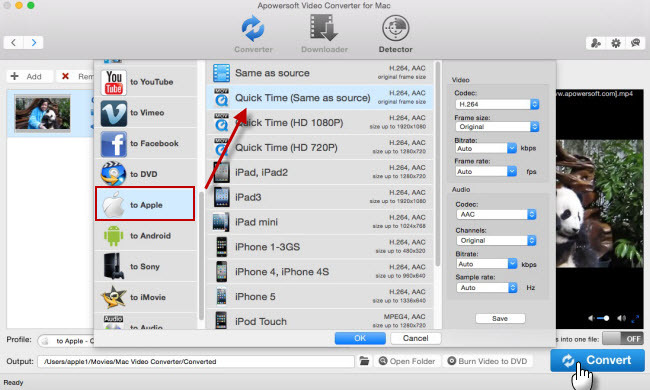 Another MTS to MOV converter is Video Converter for Mac. It’s professional converting software that offers numerous formats for output video with no quality loss. You can choose any desired format for converting and even merge multiple videos as one. Besides, this program also comes with a video downloader which is capable of detecting online streaming and downloading it automatically. The operation steps are quite easy as follow. Download the program by clicking the button above. Press “Add” on the main interface to load local MTS file. Select “MOV” by clicking up the menu of “Profile”. Choose preferred directory in “Output”. Hit on the button of “Convert” to get start and the task will be completed in a short moment. This MTS to MOV converter is more than a traditional converter that only features converting functions. You can also make use of this tool to grab any video clips online to your hard drive. It’s capable of detecting videos from most of popular video sites, such as YouTube, Dailymotion, Vimeo, etc. With this tool, you can enjoy the video clips offline and export to portable devices for watching. Refer the guide below to download online streaming. Upon the program, you can go to the tab of “Detector” then enable “Video Detector” option. Next, enter the page of the online video that you want to download. The program will detect the media stream then download it automatically. When downloading task is finished, you can find it in default path. Absolutely, you can change saving path if you prefer. Both of these two methods can convert MTS to MOV video perfectly. If you just want to convert video formats occasionally, the web-based tool will be an ideal choice. As for the professional program, it’s really a powerful video converter. Aside from managing converting issues, you can also download your favorite video streams from internet.